Work-related quality of life (WRQoL) evaluation and monitoring is particularly relevant in hospitals as employee satisfaction directly affects the quality of services offered to patients. , In comparison to other quality of work life scales, the WRQoL scale is unique as it measures various factors related to work as well as nonwork factors like general well-being (GWB) in addition to the "homework interface" (HWI). , This study attempts to validate the bilingual (English and Marathi) WRQoL scale and assess the WRQoL perceived by employees of a corporate hospital in Pune City. This was a cross-sectional study conducted on the employees of a corporate hospital in Pune, India from March 1, 2014, to April 30, 2014, after obtaining ethical approval from hospital management. The WRQoL scale  comprises 24 items out of which the last one (item 24) is a global score on overall WRQoL whereas the remaining 23 items are grouped across six psychosocial sub-scales, namely, GWB (6 items), HWI (3 items), job career satisfaction (JCS) (6 items), control at work (CAW) (3 items), working conditions (WCS) (3 items), and stress at work (SAW) (2 items). All questions in the scale are dispersed and not arranged according to domains. Three items in the scale, two in SAW (7, 19) and one item (9) in GWB sub-scale, are negatively scored for which reverse scoring was done as per the guidelines. All questions are rated on a 5 point-Likert scale: 1 = strongly disagree, 2 = disagree, 3 = neutral, 4 = agree, and 5 = strongly agree. Each sub-scale score is determined by finding the average of the items contributing to that factor. Thus, the score range for items as well as the sub-scale scores was 1-5 with 1 being the minimum and five the maximum possible score. The standard backward-forward translation method was used to develop Marathi version of the scale which was validated for suitability during the pilot study. Pilot study was a qualitative analysis to examine the suitability of items and scoring scale for the assessment of WRQoL of employees in the local context. The bilingual WRQoL scale with English and Marathi languages was pilot tested on 6% (22) employees of the hospital. The mean age of employees was 33 (±5) years and 55% were males. All the employees responded that the items in the scale are suitable for WRQoL assessment and no changes were suggested. Hence, the combined bilingual version with English and Marathi language [Annexure 1 [Additional file 1]] was used for the final study. However, the pilot study subjects were not included in the final study for analysis purpose. Data were collected for baseline socio-demographic variables, namely, gender, age, marital status, and family size. Work-related variables were the department of employee, designation, and total work experience (in years). To detect a mean WRQoL score of 50% for 389 employees of the hospital, at the desired precision of 10% and 95% confidence level, the minimum sample size for the study was computed as 126. Written Informed consent forms were distributed to the employees and those who consented to participate were included in the study. WRQoL scale and demographic data sheet were interviewer-administered to all respondents for uniformity of mode of administration. The questions were only read out without providing explanations to avoid interviewer-administered bias. Data were analyzed using Statistical Package for Social Sciences (SPSS) version 17.0 (SPSS, Inc., Chicago, IL, USA). The data were analyzed at 95% confidence level, and all results with the value of P < 0.05 were considered statistically significant. We computed mean and standard deviation for continuous variables, median, and range for ordinal variables and frequency and percentage for discrete variables. Chi-square test and Spearman's correlations were performed to find out any significant difference in sub-scale scores across the baseline variables. Out of a total of 150 employees who were requested to participate in the study, 132 provided consent for participation. The mean age of participants was 31 (±8) years. The baseline characteristics are shown in [Table 1]. [Table 2] shows the frequency of employees reporting different scores for each subscale. It is clear that majority of the employees rated WRQoL as average and above average for all sub-scales. The scores did not significantly vary across marital status, family size or gender. SAW score increased with the age of employees (χ = 296.92, p < 0.0001). WCS score significantly increased with the mean work experience of employees (χ = 421.53, p < 0.0001). JCS score was positively correlated with employees working in clinical and diagnostic departments (r = 0.5, p < 0.0001). Employment at a higher position namely manager/HOD and in-charges of departments was positively correlated with high scores in JCS (r = 0.5, p < 0.001), CAW (r = 0.31, p < 0.001 and HWI sub-scales (r = 0.36, p < 0.001). The results of the reliability analysis showed that the scale has a high internal consistency with Cronbach's alpha of 0.82 (p < 0.0001). Dimension-wise Cronbach's alpha, "corrected item-total correlations" and "alpha if item deleted" are shown in [Table 3]. As is evident from [Table 3], except CAW and SAW, the internal consistency of all sub-scales was acceptable. In CAW sub-scale, item 2 was a weak question with a high "alpha if item deleted." The reliability analysis was repeated for CAW after excluding item two which rose the Cronbach's alpha of the sub-scale from 0.45 to 0.69 (p < 0.001). In the case of SAW, both the questions are negative. However, removal of these questions did not improve the reliability neither of the sub-scale nor the overall scale. The scale was further evaluated for face validity by taking the opinion of 1 expert each from different backgrounds, namely, medical superintendent, chief human resource manager, professor of human resource management, nursing superintendent, and head-housekeeping department. All experts found the questions in the scale appropriate and valid for WRQoL assessment in the Indian context. Analysis for content validity revealed high item-domain correlations (domain with its respective items) in the range of 0.5-0.9 (p < 0.0001). The range of "item-domain" correlation for each domain was: JCS (0.5-0.76), CAW (0.6-0.8), GWB (0.55-0.76), HWI (0.66-0.86), WCS (0.68-0.79), and SAW (0.5-0.9). The "inter-domain" correlations, for evaluating content validity were 0.38 (GWB-HWI), 0.2 (GWB-CAW), 0.57 (GWB-WCS), 0.46 (GWB-SAW), 0.45 (JCS-GWB), 0.39 (JCS-HWI), 0.3 (JCS-CAW), and 0.48 (JCS-WCS) with all p < 0.001. Results of construct validity showed that the cross-domain correlations (values not given here) were significantly lower than the item domain correlations with many correlations being statistically insignificant. Thus, the WRQoL illustrated high construct validity as all items had substantially higher correlations with their intended domains rather than with other domains of the scale. Predictive validity results showed that the global score (item 24) showed significant correlations with all the domains of the scale, JCS (r = 0.36), CAW (r = 0.35), GWB (r = 0.52), HWI (r = 0.23), WCS (r = 0.46), and SAW (r = 0.24) with all p < 0.001. Linear regression was performed to evaluate the predicting effect of domain scores on the global WRQoL out of which GWB and WCS were found to have statistically significant results. The results in [Table 4] show that GWB and WCS subscales have the highest predicting effect on global WRQoL. Both subscales predict around 27% of the global WRQoL score. Hence, the global sub-scale (item 24) cannot be used solely for evaluating WRQoL across all the six sub-scales. This study attempted to evaluate the WRQoL of employees of a multi-specialty hospital and to validate the WRQoL scale. The overall WRQoL, as well as sub-scale scores, were in the moderate to a high range similar to a previous study on university staff  whereas a study on health-care workers reported lower scores in WCS, CAW, and HWI. In this study, employment at a higher position (manager/HOD/in-charges) was correlated with better scores in CAW, JCS and HWI sub-scores. This is corroborated by findings of previous studies on nurses and other nonclinical staff in hospitals. , The previous studies report that lack of autonomy in work, for nurses and nonclinical staff, is further compounded by the lower social and educational position they occupy as compared to middle-level managers and doctors. WRQoL can prove to be an important tool for monitoring WRQoL of staff at all levels and address the issues wherever needed. Besides, hospital employees at all levels work under stress round the clock and hence, need to be provided with some degree of flexibility to have some more CAW and maintain a balance between their home and work life. Similar to previous studies, WRQoL scale was found to be highly reliable with high content, construct and predictive validity in our study too. ,, We observed that the "item 2" ("I feel able to voice opinions and influence changes in my area of work") in CAW domain was weak due to a high "alpha if item deleted." Removal of this item increased the reliability of the CAW sub-scale. Item two has been suggested for removal by previous studies also, although they used other analytical tools. Dropping off weak items to improve the reliability of scale has been recommended by previous studies also. , As item 24 (satisfaction with overall WRQoL) is a global score, we assumed that it should capture the essence of the remaining 23 items in the scale that intend to measure WRQoL in different dimensions. This may be particularly useful in situations where only item 24 can be used instead of asking all questions due to time constraints or other reasons. We found that item 24 has high predictive validity only for the GWB and WCS subscales rather than all 23 items. However, further validation in larger samples may be required to support this finding. The strength of our study is that we validated the WRQoL scale in employees of an Indian hospital and found the same to be suitable, reliable, and valid. The limitation is that the sample size may not be large enough for results to be generalizable on a large scale. Nevertheless, the baseline values for WRQoL scores presented in this study can be utilized by other researches in the Indian context. WRQoL scale is a suitable instrument for application in the Indian context. However, in all the subscales, scores were in fair to a moderate range that calls for some interventions to improve WRQoL across all domains in hospital employees. Better WRQoL in employees placed on higher organizational positions indicates a need for focused measures to enhance WRQoL of employees in lower hierarchical levels, especially in CAW and home life interface domains. Future research on larger and diverse samples of working populations is further recommended. Harjani A. India′s Secret Weapon: Its Young Population; 2012. Available from: http://www.cnbc.com/id/49472962#. [Last accessed on 2014 Aug 31]. Rao KD. Situation Analysis of the Health Workforce in India. Human Resources Background Paper 1. Public Health Foundation of India; 2014. Available from: http://uhc-india.org/uploads/RaoKD_SituationAnalysisoftheHealthWorkforceinIndia.pdf. [Last accessed on 2014 Sep 03]. Van Laar D, Edwards JA, Easton S. The work-related quality of life scale for healthcare workers. J Adv Nurs 2007;60:325-33. Carrillo-García C, Solano-Ruíz Mdel C, Martínez-Roche ME, Gómez-García CI. Job satisfaction among health care workers: The role of gender and age. Rev Lat Am Enfermagem 2013;21:1314-20. Easton SA, Van DL. User Manual for the Work-Related Quality of Life (WRQoL) Scale: A Measure of Quality of Working Life. 1 st ed. United Kingdom: University of Portsmouth; 2012. Available from: http://www.qowl.co.uk. [Last accessed on 2014 Mar 23]. Field AP. Discovering Statistics Using SPSS (Introducing Statistical Method). 2 nd ed. London: Sage Publications; 2005. Available from: http://www.statisticshell.com/docs/reliability.pdf. [Last accessed on 2008 Nov 13]. Eiser C, Morse R. Quality-of-life measures in chronic diseases of childhood. Health Technol Assess 2001;5:1-157. Skevington SM, Lotfy M, O′Connell KA; WHOQOL Group. The World Health Organization′s WHOQOL-BREF quality of life assessment: Psychometric properties and results of the international field trial. A report from the WHOQOL group. Qual Life Res 2004;13:299-310. Chan YH. Biostatistics 104: Correlational analysis. Singapore Med J 2003;44:614-9. Improving Quality of Working Life. Quality of Working Life Survey (December 2007 to January, 2008). Cardiff University, Cardiff, Wales, UK. Available from: http://www.cardiff.ac.uk/humrs/pwe/quality/0310%20Portsmouth%20Survey%20Results.doc. [Last accessed on 2014 Aug 12]. Sirisawasd P, Chaiear N, Johns NP, Khiewyoo J. Validation of the thai version of a work-related quality of life scale in the nursing profession. Saf Health Work 2014;5:80-5. Pandit N, Pant R. Study of quality of work life of nurses and its impact on their job satisfaction in selected private & government hospitals of Gujarat [Online]. Int J Bus Res 2010;10. Available from: http://www.freepatentsonline.com/article/International-Journal-Business-Research/243957224.html. [Last accessed on 2014 Sep 11]. Opollo JG, Gray J, Spies LA. 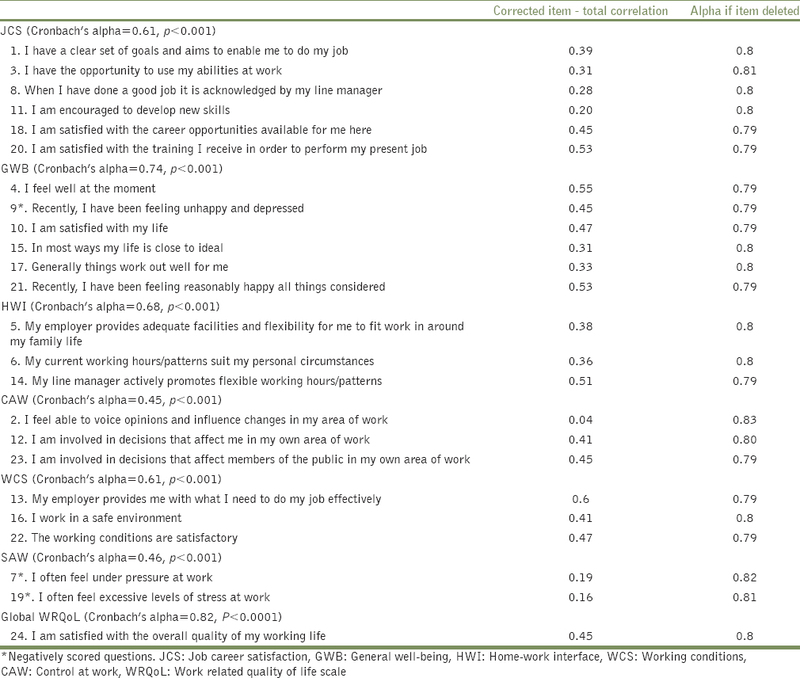 Work-related quality of life of Ugandan healthcare workers. Int Nurs Rev 2014;61:116-23. Kvist T, Mäntynen R, Vehviläinen-Julkunen K. Does Finnish hospital staff job satisfaction vary across occupational groups? BMC Health Serv Res 2013;13:376. Saraji GN, Dargahi H. Study of quality of work life (QWL). Iran J Public Health 2006;35:8-14. Rani S, Kamalanabhan, Selvarani. Work/life balance reflections on employee satisfaction. Serbian J Manag 2011;6:85-96. Duyan EC, Aytaç S, Akyýldýz N, Laar DV. Measuring work related quality of life and affective well-being in Turkey. Mediterr J Soc Sci 2013;4:105-16. Chen WS, Haniff J, Siau CS, Seet W, Loh SF, Jamil MH, et al. Psychometric properties of the Malay work-related quality of life (WRQoL) scale in Malaysia. World J Soc Sci Res 2014;1:57-67. Zeng X, Chaiear N, Klainin P, Khiewyoo J, Koh D, Hien PW, et al. Work-related quality of life scale among Singaporean nurses. Asian Biomed 2011;5:467-74. Chen K, Wu C, Yao G. Applicability of the WHOQOL-BREF on early adolescence. Soc Indic Res 2006;79:215-34.